Bird banding activities began at Hilton Pond Center for Piedmont Natural History on 28 June 1982. 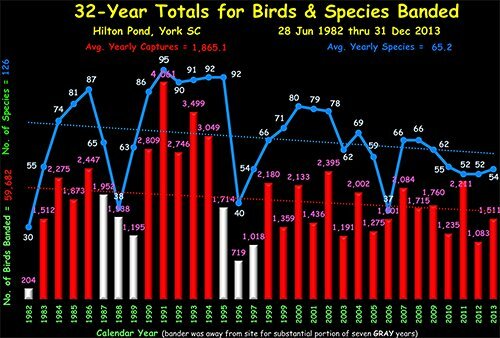 Banding has been done year-round by master bird bander Bill Hilton Jr. in all years since, except those designated above as "partial" years (due to extended off-site job commitments). Through 31 Dec 2013, a total of 59,682 birds from 126 species had been banded--a yearly average of 1,865.1 birds and 65.2 species for the 32-year span. The highest number of birds captured in a single calendar year was 4,061 in 1991--also the year with the highest number of species (95). During the period 1982-1987 and 1998-1999, Hilton was teaching or working full-time in the York region, so banding occurred primarily on weekends and during summer months. Since he was working at remote locations in 1987-88 and 1995-98, banding was conducted only on sporadic trips back to York, hence the cross-hatched "partial banding years" designation on the chart above. From 1990 through 1994 Hilton worked out of Hilton Pond Center as a consultant and from 2000-present full-time as executive director, so banding also frequently occurred on weekdays.